In the Government Order 2nd cited, Examination Scheme for various services was prescribed. Government have examined the requirement of Descriptive tests and Interviews for Lower level posts in Tune with the latest National Policy. Accordingly, Scheme of Examinations for various services was reframed and notified through G.O. 3rd read above. However, a few more changes have become necessary to certain posts. 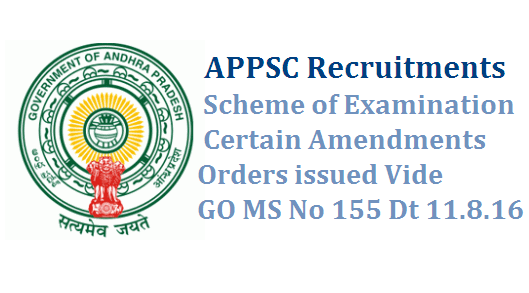 In exercise of the powers vested with Government as per Article 320 of the Constitution of India and as per Regulation 14A of Andhra Pradesh Public Service Commission’s Regulations, 1963, revised Annexure-II and Annexure-V are appended to G.O.Ms.No.141, Dated:01.08.2016 duly replacing the existing Annexure-II and Annexure-V and new Annexure-VII is also added to the said G.O. With the issue of these orders the contents contained in reference third read above become in-operational in so far as they are inconsistent with these orders.